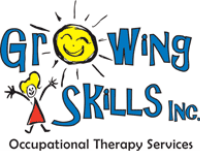 Growing Skills Inc. is a Calgary-based dynamic Occupational Therapy private practice servicing children ages 2 years to adolescence. As of September 2017, the therapy space is no longer available! Services provided must occur within your home or the community. Assessment services will occur either at your home or within my home-based office located in McKenzie Towne (Southeast Calgary). Treatment provided focuses on child-directed, motivating, fun, and "just right" challenges and activities to facilitate growth and development in your child's areas of need. *I am accepting new clients for assessment purposes (available May-September 2019). **I am accepting new clients ages 2-5 that are looking for FSCD services that live in the southeast (Auburn Bay, Mahogany, Seton, Cranston, Chaparral, McKenzie Towne/Lake, New Brighton, Copperfield, Shawnessey, Sundance) or Okotoks area. *** I am not accepting school-aged children.